It’s been more than four years since MediaPost, in partnership with OwnerIQ, launched an index to track the real-time supply-and-demand of the programmatic advertising marketplace. In retrospect, that index -- the RTB500 -- didn’t accomplish what we set out to do and it has since gone dormant, because it got little traction in the industry. I have many thoughts about why it failed, including my own inability to convey why the industry needed a real-time market ticker akin to Wall Street’s. The index currently is based only on programmatic marketplace for digital inventory in the Czech market, but R2B2 will start publishing data on the Slovak market this year, as well. In terms of coverage, R2B2 claims to represent “10 million” computer, mobile and TV screens. It says its index is based on average prices of RTB ads bought in its network on monthly basis, including all major metrics (CTR, CPM, CPC, etc.). I cannot begin to suggest that the index is representative of other markets, especially the U.S. It’s probably not, as R2B2 notes in its release, the programmatic market in the Czech Republic is growing especially fast. So take these findings with a relative grain of salt depending on what marketplace you operate in. 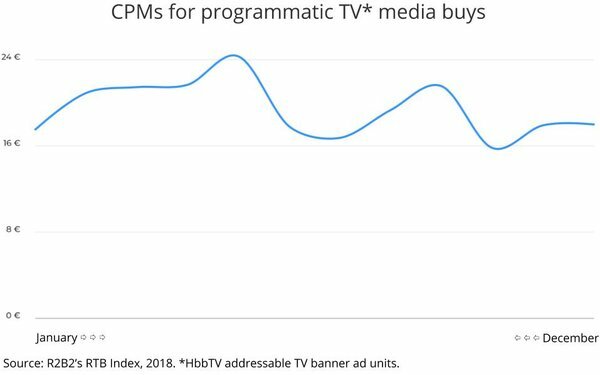 Lastly, the most interesting part of the index is that it also includes a supply-and-demand snapshot for the burgeoning programmatic TV marketplace, vis a vis TV banner ads that can be bought programmatically via Czech addressable TV operator HbbTV’s technology. So what does the index show? Well, in terms of the overall programmatic supply-and-demand, it seems to relatively flat pricing, especially for banner and native ads, but there are some pockets of volatility. Video, despite some fluctuation, has generally been yielding increasingly higher CPMs. “Video ads had the highest cost per thousand impressions throughout the entire year, which averaged €5.73,” R2B2’s report notes. 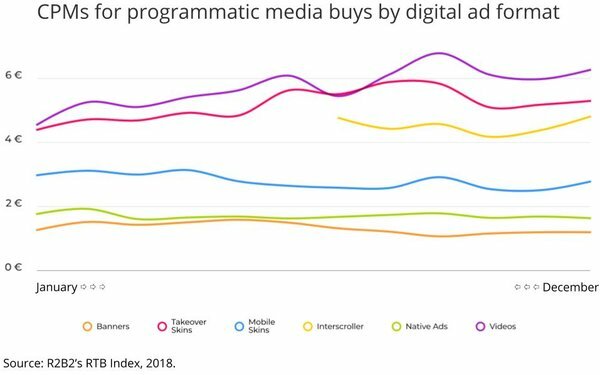 Interestingly, the fledgling programmatic TV market has been relatively flat, albeit at disproporationately higher CPMs than other forms of programmatic digital inventory. I’m not sure why programmatic TV ad pricing would be so flat, especially given that average clickthrough rates for the medium have been accelerating, at least in the Czech Republic, but I think it probably has to do with the fact that it doesn’t yet scale the way other programmatic inventory does. We’ll check back with R2B2’s index from time to time, but if you’re aware of any other programmatic market indexes worth covering, please let me know at joe@mediapost.com.